It’s time to add another book to your library! 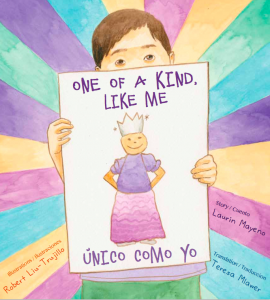 One of a Kind Like Me/Único Como Yo is a bilingual children’s book based on the true story of a child named Danny who wanted to be a princess in the school parade. He and his mom embark on a venture to find a purple princess dress. The book’s author is Laurin Mayeno, is the founder of Out Proud Families and the proud mixed-race mother of a multiracial gay son who was gender nonconforming as a child. When my son Danny told me he wanted to be a princess for Halloween, I was worried that he would be teased and I would be judged. I suggested another costume, but Danny knew what he wanted. I decided to support him and we created a beautiful purple princess dress. He wore it happily in the school parade and kept it for years. Although I didn’t know it then, I later came to realize that having a gender-creative child was a beautiful gift. Being Danny’s mom, I have learned to appreciate children who don’t follow expectations based on gender. I also have seen how pressure to fit gender expectations can make life hard for any child. We can help all children feel safe and accepted by allowing them to explore a full range of activities without restricting or criticizing what they do based on gender. We can also make a difference by encouraging children to be respectful and kind to their peers, and by letting them know that teasing and bullying hurt. If you have a child who doesn’t follow society’s gender norms, rest assured that you are not alone. It is perfectly healthy to explore different ways of expressing gender. If you have concerns and fears, as I did, learning about gender diversity and connecting with other families like yours can give you confidence and peace of mind. Enter to win a copy of One of a Kind Like Me/Único Como Yo by leaving a comment below. A winner will be announced here, on Facebook and on Twitter on Friday (January 20, 2017). I posted the following video of C.J. to social media and forgot to share it here. It’s just another glimpse into what life is like raising a fabulous, spirited son. Me: We’re going to dine alfresco and act like a nice, normal family. C.J. : You can be normal. I’m going to be Beyonce. This entry was posted in All Posts and tagged Beyonce, gender creative, gender nonconforming, Giveaway, LGBTQ, Orange County, parenting. Bookmark the permalink. I know I missed the contest. LOL! Well, I am sure to put this into our to-be-bought list! I know my kids will love it! Great vid! Thanks for sharing! I needed a smile today. Thank you for sharing about this book, it is one I’d love to add to out library. As the parent of a gender non-conforming son. I’m always looking for ways to share that he is not alone. Love to see kids books talking about these important topics! I would love to read this with my child! This sounds like a lovely addition to our library! My father in law’s ideas of gender stereotypes and conformity boggle my mind. He apologized for getting my daughter a blue stuffed dog because it was the only color they had, as if I would even care. Hey Rainbowers! I’m Sean the gender-fluid-non-conforming-trans-kid who is sick of labels and prefers gendercool 🙂 Just wondering if you are going to the Gender Spectrum Conference this year. I’ll be there on the youth council. Peace! My daughter is a therapist with foster and adopted children. I bet she could use this book. Thanks for the chance to win it. My sweet little one was jasmine for halloween! He would love this! Thanks for the opportunity. I’d love this book for my own children as well as sharing with my students st school. So excited to see another youth book. We are always thrilled to have books to share with our rural youth who feel so isolated and alone in their schools and communities. OUT Maine, a small nonprofit in rural Maine, is working hard to support LGBTQ youth in rural Maine through building welcoming and affirming communities. Every donation and resource we receive goes to educating, supporting and empowering youth. Would love to be able to add this to our small resource library. Would love to add this to my 3 year old’s library! I love books like this! My kids would love this one! And thank you for writing, all the time! We’d love a copy of this! My son is just figuring out the gender expectations and I am working to encourage him to continue to express his true self, much to the chagrin of my mother. I’d love this book for my transgender latina daughter to read first and then pass it on to the dual language school where I teach and she attended. 65% of the 700 student school are native Spanish speakers and I know of two students in K and in 1st grade, one white and one latino, who are questioning their gender. It is important for all students to read about the many ways we can express ourselves. This book sounds amazing! So glad that books like this finally exist! I would love to give this book to my local library. The director and I are always looking for books about gender. Would absolultely love to add this to the TYES (trans youth education & support) lending library here in Colorado as we are starting to serve more more Spanish-speaking parents of gender expanisve kiddos. I would love to add this to my 4th grade classroom library! I would love a copy of this book. Would love to add it to my collection of gender creative themed books for children!! I love your posts. It’s a challenge for my son to be himself. He is 7 and is aware of the social “norms” and it seems our house is his safe zone. I let him know that he can be himself anywhere he wants to…when HE wants to. And I continue to support him in every way. I work at an elementary school and have a gender non-conforming second grader I’ve been doing my best to support. He is being raised by his grandmother who speaks only Spanish and is struggling to understand her grandsons obsession with all things ink and sparkly. I would LOVE to be able to give this book to them to try and help bridge the gap a little more! Hi Marcy, Congrats on being the winner! Can you please email your mailing address to me at raisingmyrainbow@gmail.com and I’ll drop the book in the mail to you? Cheers to knowing himself at such a young age. More power to you, CJ! But also … lol @ I’m gonna be Beyonce. Love it!